The first ever Hydro Mechanical Watch by HYT called the H1. A manually wound watch with an amazing 65 hour power reserve. 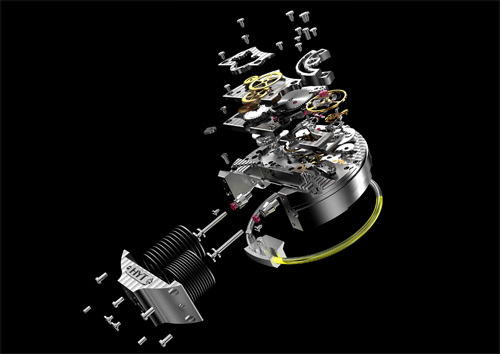 The movement was designed by Jean-Francois Mojon and a Swiss company called Helbling Techniks. Once wound the movement causes 2 tiny pistons to pump a florescent liquid through a tube to indicate what time it is.